This climate has got magic in it, this season uplifts mood. Your life may be burdened with numerous difficulties but monsoon rains bring joy, an unconditional happiness, it gives encouragement and enthuses to do something great. It would really be a shame if nature is not explored in this season, rather this season is best to explore nature and view it in its amazing form. So why just get out of house on roads, follow the muddy trails and climb the peak. That is what we did with Small Steps Adventures; Trekked to kalsubai – the highest peak of western ghats in Maharashtra region. The base village Bari is located near Mumbai –Nashik highway few km from Kasara. Train to Kasara and jeeps till base village has become routine for trekkers. Welcome aboard 76 trekkers was the count this time and it seems that the day was reserved just for us to climb the peak. Well without much delay we started climbing waited for just tea and snacks. Get going was the call and so did we! Lighting the torches, the night trek seemed like more of a treasure hunt. The clouds hovered over us hiding the stars and moon, drizzling rains sometimes. It felt cool and pleasant. The trek is just a walk up to the peak no tricky patches and no risky trails. It is up ahead to the peak with few plateaus in between. Step by step we moved up, music was being played on some speaker, people were singing songs, chit chatting and with all hustle and bustle our march towards peak was progressing. The climate was exceptionally pleasant; it was the perfect start of monsoon!! There are steps and railings built, ladders put on so it is quite easy to climb. As the dawn broke, we were still hovered by clouds, but now we had reached up high that we were also in the midst of them. We had covered more than half the climb, frequently resting and eating snacks. Suddenly the sun came out from the clouds and clouds again covered the sun; the game of hide and seek was being played between them. The path to the mountain peak is beautiful and the season brings some kind of a very different personified image of nature in it. The view down from the mountain is quite scenic and gives a sense of wonderment. There are many huts in between of villagers that provide food and refreshments. 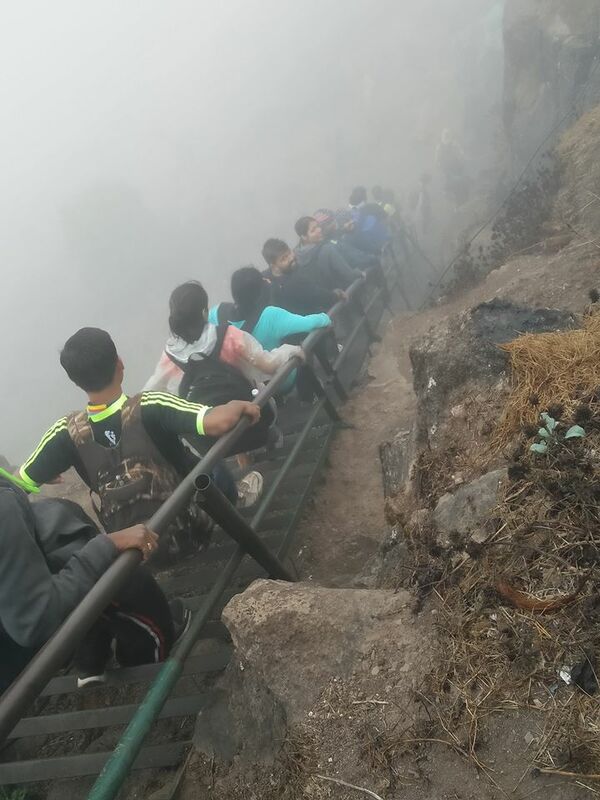 Eventually climbing the stairs, ladders and rocks while clicking photos and selfies wherever we could find a great spot; we reached the top 5400 feet above the ground level. The peak is circular in shape with a temple of ‘kalsubai’ at the center thus the name of the peak. There railings built around the peak. There was so much of fog here that the sight of valley was invisible. Here we just let ourselves lose, dancing, clicking photographs in various poses, singing songs. After spending some time here we all sat in a circular shape and gave our introductions. Well various backgrounds and various interests, but we all had come to climb the peak and we did it. 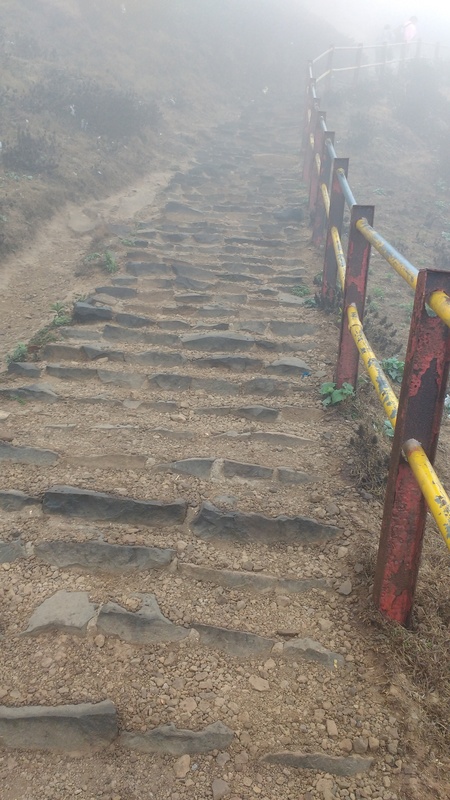 Then with a loud cry of ‘Jai Bhavani and Jai Shivaji; we started to descend. The clouds had started to clear now and we were in no hurry to descend fast. Enjoying the view, taking our sweet little time to absorb it we moved downwards. On the plateaus while coming down we experimented with the photographs and videos, it was lot of fun videos of someone punching other (just an action not in real), someone kicking well it was great to get mixed with other people. So we descended with fun and laughter and reached the base village from where we had started. Well after climbing peak and descending the hot meal is a heaven to stomach with surprise of ‘gulab jam.’ It had also started to rain moderately now. Well the journey had come to an end packing our bags we moved towards our jeep and one by one bid adieu. It was a great journey to the peak with such a large group well organized by Small Steps Adventures. One of the memorable treks I have had so far. How to reach Kalsubai: Reach Kasara by train (for Mumbai), from Kasara transport to base village. 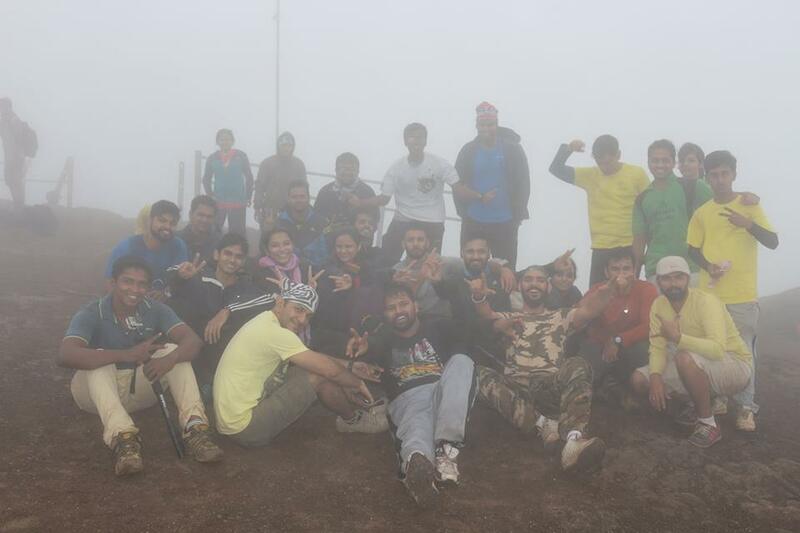 It’s easy to arrange travel to Kalsubai trek from Mumbaicompared to Pune.